The IELOL 2019 Immersion program will begin Monday, August 5th at 8:00 AM and conclude Thursday, August 8th at 1:00 PM. * Immersion activities will occur on the University of Central Florida Campus. *Please check back occasionally as the program plan may change. 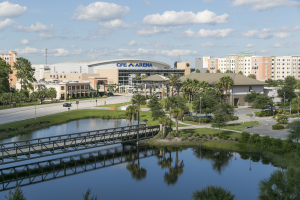 The Online Learning Consortium (OLC) in collaboration with the University of Central Florida (UCF), will provide an intensive, comprehensive leadership development program to expand the career pathways and networks of leaders in the field of digital and online education. The Institute for Emerging Leadership in Online Learning (IELOL) is a unique blended-learning leadership development program sponsored by the Online Learning Consortium and the University of Central Florida. IELOL serves the development needs of emerging leaders responsible for a variety of online and digital learning initiatives. *Program competencies were drawn from work published by the Center for Creative Leadership. Readiness to Lead Operationally and Strategically: Today’s online learning leader is confronted with a dizzying array of both day-to-day operations issues as well as numerous strategic opportunities and challenges. The focus of Day 1 is to provide an opportunity for self-reflection as we begin the process of unbundling a number of key core competencies of today’s online learning leader. To set the stage, we’ll provide opportunities to reflect on current practices in today’s dynamic learning environments. Communicating Within, Throughout, and Beyond: Today’s online learning leader finds themselves in a multitude of organizational settings (centralized or decentralized, top-down or bottom-up focus on innovation) and institutional types (college or university, public or private, large or small), but what they have in common is a need to effectively communicate within, throughout, and beyond their organization for the purposes of collaborating with stakeholders and managing complex initiatives. The online learning leader must not only stay abreast of key external forces impacting on their institution, but they must be attentive to issues of relevance and positioning internally. The focus of Day 2 is to identify external forces impacting today’s higher education institutions while balancing those with important internal deliverables. Leading Change and Transformative Initiatives: As more institutions launch or grow their online programs, online learning leaders find themselves in an increasingly hyper-competitive landscape. The leader of tomorrow needs to understand the approaches and strategies in which they can affect positive change at their institution. The focus of Day 3 is to lay a foundation for the requisite knowledge base, experiences, and skills of tomorrow’s leaders. Topics will include current and emerging trends, as well as developing strategy, leading change, and moving forward transformative initiatives. Making the Case: Today’s digital learning leaders are often called upon to provide a case for support for current efforts, make recommendations for change, or shape directions which can have lasting results (either positive or negative) on institutions. In an environment of increasingly scarce resources, unprecedented change, or uncertainty, making the case for projects/initiatives that require new resources or reallocation of existing resources require a comprehensive research-based, collaborative, systemic approach. A culminating activity of the immersion experience is a simulation. During this simulation leader participants make group presentations to request resources from an institutional Digital Learning Council representing senior leaders who make resource allocation decisions on a campus. While reasonable efforts will be made to adhere to the advertised package, OLC reserves the right to substitute speakers and/or seminar content.